The flag of Switzerland is a white cross in the center of a red background. The flag is one of only a few flags that are square. The Swiss flag is one of the oldest flags in history. The flag was first used as an emblem for soldiers going into battle in the late 14th century to depict their Christian faith. The emblem was then adapted onto an emblem and seal and was used in 1848 as the military flag. 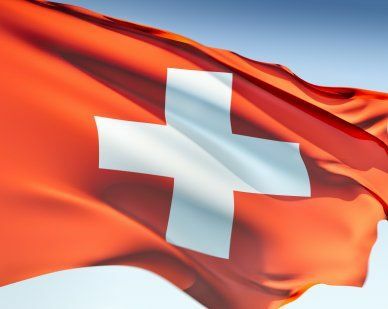 The Switzerland flag was adopted as the national flag in 1889. the white cross on the red base symbolizes faith in Christianity and stands for freedom, honor and neutrality. Our top-quality Switzerland flags conform to all official specifications. Emblems and designs are executed with the highest possible degree of accuracy in regard to detail, color shades, placement and proportion to flag size.